You've found the ultimate candle sale! 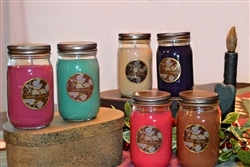 Check out our six-pack of soy wax candles in large mason jars for $12.91 per jar. All of our candles are made from all-natural soy wax with clean-burning wicks guaranteed to burn all the way to the bottom. Choose any 6 scented soy candles from our wide selection of handmade soy wax fragrances to create a truly unique aroma in your home or office. Our six-pack of soy wax candles delivers hours of delicate fragrance, transforming any room into a relaxing sanctuary. 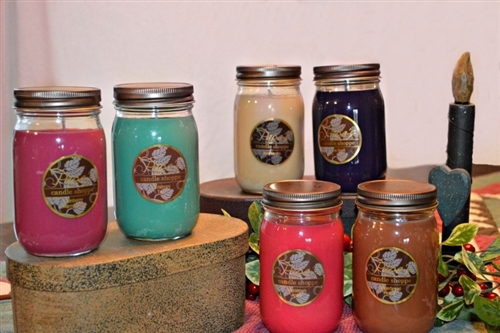 The set of six Mason jar candles comes in decorative canning jars with lids and with vibrantly colored soy wax that complements any style. Our 16-oz Mason jar candle six-pack will fill your home or office with the most pleasant fragrances and makes the perfect gift for your most cherished loved ones. We hand make all of our soy wax candles right here in the USA with the highest-quality ingredients to ensure you receive great-smelling, long-lasting soy candles. Order online to take advantage of our great prices and free shipping on all orders today! Very nice with subtle, gentle aromas. Delivery was fast. Recommended. Will likely order more.